MyRepublic offers unlimited internet on the fastest Gigabit Fibre speed available at your location (up to Fibre Pro 950Mbps¹) for one low price of $74.99 per month on a 12 month contract. Or upgrade to Gamer on a 12-month term and receive a $200 discount off the PlayStation®4 500GB Fortnite Bundle (RRP of $489.95). Pricing available exclusively to residents in Dunedin in selected areas who order by midnight the 03/09/2018. ¹Important information on Speed: Available to new residential customers exclusively in Dunedin where Fibre is available. Speeds will vary. The speeds quoted are based on nominal access line speed. Up to 950Mbps Download and 500Mbps Upload is based on a wired connection. Gigatown Gamer plan is available to residential customers in selected areas who order by midnight the 30th August 2018. $200 discount code to be redeemed against the PlayStation®4 500GB Fortnite Bundle when you purchase online from the Sony store. PlayStation®4 500GB Fortnite Bundle comes with bonus Royale Bomber Skin and 500 V-Bucks (In-Game Currency). PlayStation Stand sold separately. Promotional terms and conditions apply. This is a 12 month contract, an early termination fee of up to $240 will apply.Your actual download and upload speeds can be slower than the nominal access line speed and may vary due to a range of factors. 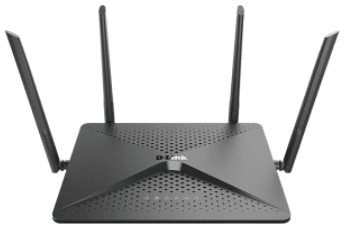 If you have a large house- the DLink AC2600 Wi-Fi Gigabit Router (DIR-882) combines ultra-fast next generation Wi-Fi with Gigabit Ethernet and a dual-core processor for enhanced performance, with advanced AC SmartBeam which can bring dead zones back to life by delivering individual beams of bandwidth where you need it. 4 Gigabit ports give you lightning fast wired connections and dual USB ports let you access content on your network. The MyRepublic Wi-Fi Hub+ has AC1600 technology and is also dual band, providing a good modem for small- medium households. Wireless-AC has wider bandwidth capabilities of 80 MHz (and an optional 160 MHz). By comparison, older N-Series Modems bandwidth was only 20 or 40 MHz. Imagine the MHz as lanes on a highway: 20 MHz represents 2 lanes and 80 MHz represents 8 lanes. The more lanes available, the larger the amount of data that can pass through simultaneously, giving you the maximum performance connection speed. Both Modems use wireless-AC with a choice of the 5 GHz and 2.4 GHz bands. 5Ghz has the ability to transfer data at faster speeds so people will use the 5GHz frequency most of the time, but if you are on the edge of your Wi-Fi Modem’s reach, use the 2.4 GHz network as it is slower but more stable when you are further away from your connection point.